PDO COG threads application aims at rejuvenation, brightness, production of new collagen and firmness. The threads are inserted on the chin, cheek, neck, arms, thighs and buttocks. 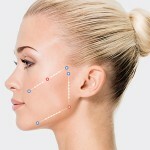 The treatment is completed in 1,5 to 2 months and the effect lasts 12 to 18 months.